Program is the means by which League members educate themselves and prepare for action. The subjects for study are suggested by members of the League and are adopted at local annual meetings and/or state and national conventions. After thorough study, a topic is presented to members for consensus. If common agreement is reached, that item becomes a position, which the League can support and upon which it can take action. Action takes several forms: letter writing, testifying at public hearings, serving on a variety of commissions, committees, etc., and lobbying at both state and national levels for legislative input. · Support for zoning, which promotes orderly community growth and inhibits urban neighborhood deterioration, and for minimal and cautious use of conditional zoning. Support for housing and building code enforcement. · Support of the concept of a comprehensive land use plan for the City of Akron, and for regular updates with citizen input of the Land Use and Development Guide Plan. · Support of measures to improve the quality of recreation in the Akron community and development and implementation of a master plan for parks and recreation. Continued monitoring of these plans and their implementation. Support of downtown Akron revitalization projects that will benefit the community without sacrificing historical integrity. Support for the charter form of city government and monitoring of any revision of the City of Akron Charter. Support legislation to fill city council ward member vacancies by vote of ward precinct committee representatives, and council-at-large member vacancies by vote of city precinct representatives if half of term remains; filling shall be temporary with some provision made for election at the next regular election. Support for municipal revenues to be raised in a fair and equitable manner to provide an adequate level of services, and consideration of the effect on the city’s finances in determining LWVAA positions on municipal issues. Support of the Akron Civil Service system. Support efforts to increase accessibility and timeliness of campaign finance information. Support limitations on campaign contributions from all sources. Support limitations on cash contributions from all sources and the dispensing of receipts for each cash contribution received. Support for the monitoring of effects of contaminants and land use on water supply, and monitoring of inspection processes. Support for the monitoring of effects of land use on the water supply and the effects of extraction and consumption of water by industry. Support the philosophy that children should have opportunity for education commensurate with their abilities and sup-port measures to provide adequate educational programs, facilities and finances for the Akron Area public schools. Support for the LWVO position that supports a funding system for public elementary and secondary education that is accountable and responsive to the taxpayer. LWVO believes that public funds should only be used for public schools. Support of the Lake Erie Basin Committee and of measures to preserve and restore Lake Erie and its tributaries. Support of continued development of the Cuyahoga Valley National Park and its restoration and preservation as an open green area. Support of policies to ensure adequate funding, necessary land acquisition, preservation of green space, coordination and citizen involvement in the Metropolitan Park System serving Summit County. Support the inclusion in the Ohio and Erie Canal National Heritage Corridor of those segments of the Ohio and Erie Canal Corridor which are in our area. 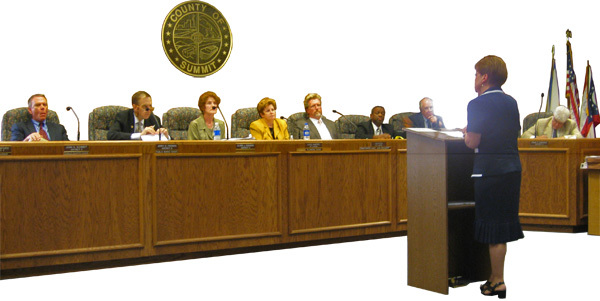 Support of countywide planning and cooperation with adjacent counties. Support of long range (25 years or more) land use plan for all areas within Summit County which provides for efficient transportation, efficient delivery of services, and protection for environmentally fragile areas such as steep slopes, flood plains, scenic areas and wetlands. Support of appropriate incentives for adaptive reuse and rehabilitation of existing structures. Support of zoning patterns that conserve open space and preserve scenic, historic and cultural resources. LWVAA opposes granting variances or conditional uses which undermine the intent of such zoning patterns. Support more stringent measures regulating signage. Support of the use of natural buffer zones, preferably but not limited to native vegetation, along transportation corridors and to separate commercial/industrial developments from residential or scenic areas, unless it is part of a planned community. Support and encouragement of ordinances/resolutions requiring that desirable species of trees and other vegetation, which might otherwise be cleared for development, be retained on the site. Support of the provision of incentives for use of hardy native vegetation in buffer zones, developments and in general landscaping, in order to reduce maintenance and minimize the use of fertilizers and pesticides. Support mass transportation in Summit County with a focus on being available for employment and coordinate all land use planning with transportation. a personnel system base on merit. Review of countywide tax levies and the prevailing system of submission of individual tax levies by non-elected agency boards. Support of programs for the aged in Summit County including housing assistance (government, voluntary or private), financial assistance and social services. Support for programs that help the developmentally challenged to meet their basic human needs. Support an effective planning process, adequate funding and provision for the most appropriate treatment and services for persons with disabilities. Support equal access to affordable housing for all income levels. Support for policies and programs that protect the well-being, development and safety of all children.